The enduring Cassini spacecraft returns with new insight into the hydrocarbon seas from Saturn’s moon Titan. 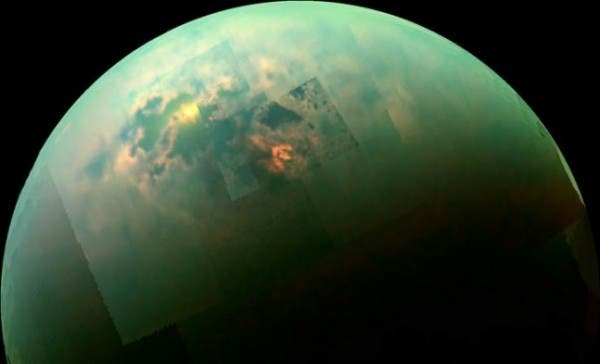 The latest findings were reported after the spacecraft’s most recent flyby above Titan’s northern hemisphere on August 21, where it performed observations of the largest liquid methane/ethane sea, the 400,000 square kilometre Kraken Mare. The Cassini astronomers were looking to probe the methane sea’s depths, but meanwhile they come across something more interesting: strange floating features reminiscent of the “Magic Island” found on Ligeia Mare, another large methane sea. 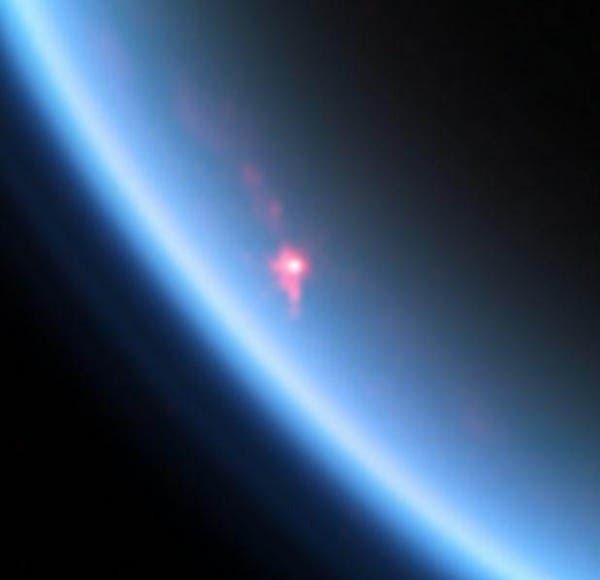 In contrast to a previously reported bright, mystery feature called “Magic Island” in another of Titan’s large seas, Ligeia Mare, these new features were observed with both radar data and images from Cassini’s Visible and Infrared Mapping Spectrometer (VIMS). Because the researchers have two different data sets at two different wavelengths this will help them better assess what these mysterious features represent. So far, the VIMS data suggests these features might be waves or floating debris. Cassini’s radar instrument images show that a bright feature appeared in Kraken Mare, Titan’s largest sea. Ligeia Mare’s Magic Island was first discovered in July 2013, covering an area of some 260 square kilometres. During another flyby in August 2013, data from the Synthetic Aperture Radar (SAR) showed that Magic Island was still there yet the bright features had evolved. Clearly, Cassini shows that Titan’s polar seas are extremely dynamic and hold many mysteries. More observations are required, but our next shot won’t be until January 2015, when Cassini is scheduled to observe the original “magic island” feature in Ligeia Mare once more. During this most recent flyby, Cassini also probed the depths of Kraken Mare. The spacecraft collect altimetry (or height) data, using the spacecraft’s radar instrument along a 120-mile (200-kilometer) shore-to-shore track of Kraken Mare. Reflections were isolated for a shallow 40 km segment. The distinctive double-peaked returns from a region near the mouth of a flooded river valley that feeds the sea indicates liquid methane depths of 20-35 m. For the remainder of 160 km, no observations could be made. The signal most likely became skewed because the liquid was more absorbing than Ligeia Mare or the depths were too high (greater than 200m). For comparison, central Ligeia Mare was 160 m deep. It should be interesting to see how deep Kraken Mare is off-coast. 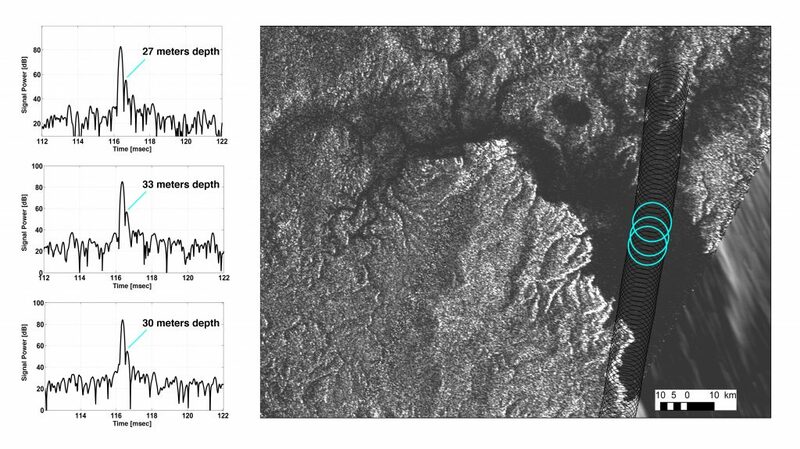 Cassini radar data reveal the depth of a liquid methane/ethane sea on Saturn’s moon Titan near the mouth of a large, flooded river valley. Learn more at NASA’s Cassini mission homepage.